Retail $17.99 SAVE 9% ! "Greatest bang for the buck motor!" Has to be one of the best &apos;bang for the bucks&apos; reloadable 29 mm motors, in my opinion! The White Lightning propellant produces a big, bright white flame and lots of smoke! And a nice very audible sound as soon as it ignites! One of my favorites. For use in RMS 29mm E, F, G motor. White Lightning looks and sounds like actual sounding rockets and launch vehicles. White Lightning propellant formulation: a brilliant white flame, dense bright white exhaust, and a throaty roar. Easy to track and exciting to watch! The average thrust of the motor is 14.4 pounds (64 Newtons). Time delay of 7 seconds between propellant burnout and the firing of the ejection charge. Uses the exclusive Copperhead single lead igniter. Ignites by electrical means only. Certified by the National Association of Rocketry. -Aft O-Ring (1/16" thick x 1" O.D.). Assembly and operation instructions provided. This is actually pretty good for its price. It&apos;s refillable so technically it can be used forever or until it breaks. So far I&apos;ve refilled this 7 times and used it 7 times. It doesn&apos;t look to be breaking any time soon. "Hits hard, plus a good sustaining thrust"
I&apos;ve used G64&apos;s for approximately 25 years, and it&apos;s a great motor. The thrust curve of the G64 is nearly perfect in my opinion. It hits hard and can have a 2-pound rocket moving at very stable speeds (45 ft/sec) at the end of a 5 or 6 foot launch rod. After the initial punch, the thrust tapers off due to the C-slot grain design, providing a nice, long sustaining thrust. The only downside I&apos;ve encountered with White Lightning propellant is that it can be difficult to ignite at times. A thermalite booster can be helpful in this case. 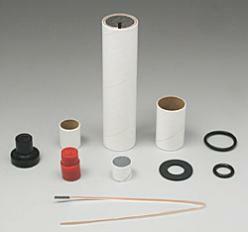 This reload kit is only for use in Aerotech's RMS-29/40-120 motor. Read and follow the safety codes of the National Association of Rocketry (NAR) and the Tripoli Rocketry Association and comply with all federal, state and local laws in all activities with hobby rockets. Damaged or defective reloads should be returned to Aerotech.